Considers the idea of the wave and the concept of phase and how the manipulation of these enabled Fathom to be constructed. Reference this essay: Grant, Jane and John Matthias. “Fathom: Surfaces, Symmetries, Arrivals, and Departures.” In Leonardo Electronic Almanac 22, no. 1, edited by Lanfranco Aceti, Paul Thomas, and Edward Colless. Cambridge, MA: LEA / MIT Press, 2017. Fathom is a sound installation by Jane Grant and John Matthias that was commissioned by the River Tamar Project and premiered at the Factory Cooperage Building in Royal William Yard, Plymouth, UK in September 2013. Visitors entering the installation were able to hear live and edited sound recorded underwater in Plymouth Sound, a large estuarine body of water from which the Plym, Tamar, and Hamaoze Rivers flow into the sea. They were also able to climb out of the underwater sonic environment, above the Fathom, to hear live acoustic sound relayed by microphones above the water. In this paper we will explore some of the poetics of the work, particularly regarding the relationship of the surface to the planet and the moon, the relationship of a surface to a body of water, what it is to break through that surface, and how waves of sound reflect and cancel. We will also consider the idea of the wave and the concept of phaseand how the manipulation of these enabled the work to be constructed. Fathom, Jane Grant, John Matthias, 2012. Sound installation, dimensions variable. Photograph by Guy Harris. © River Tamar Project, 2012. Used with permission. To dwell on the surface of the earth is to occupy a seemingly endless atmosphere. The air, the instrument of relation, affords movement with seemingly little friction or engulfment. We do not often think of ourselves as submerged in a vast depth of air, evolved as we are to breath and move through it. It might seem that we do not inhabit the earth as we live on the earth’s mantle, not within the dark and soiled ground. Humans and animals are bound to the earth by gravity. Things grow or are made around us, beside us, and above us, but they exist at a distance from the body and its perceptions. The air—our atmosphere—does not engulf the body, but rather supports the body’s functions. Air is subtle when compared to the thick, suffocating medium of water. What of the complexity of the relationship of the medium to its environment? What of the complexity, nuance, and evolution of the many particularities of the many bodies that inhabit the earth-sky? The extension of our vision through the microscope/telescope has allowed us to see deeper into the complexity of things, both intimately of the earth and at distances, so far that we may need another physics to comprehend them. Unlike seeing, which can be uncoupled from the body, the extension of our fleshy body is a somewhat more complex and clumsy affair, whether the inhabited medium is out there in space or inhabiting the deep thickness of the ocean. “Yet is there any greater rapture than the sea? For he who climbs high to set his senses areel as of from good wine must still climb down again at last. And his rapture lasts only so long. And all kinds of depressions lie in wait, and the spell is often broken. The ocean is the vast body of water that covers a larger portion of the earth than the thick, viscous matter of land. Infinitely changing, the land is shaped by the wind, by human and animal endeavor, by deep underground eruptions. It seems that the matter of the earth, the land, is relational only to itself, to matters on the earth and its atmosphere, in an endogenous process of mutability. The ocean, however, is subject to tidal forces that in recent years have been so violent across many parts of the earth that they threaten to engulf the matter of the earth, to change its boundaries, to overstep the littoral only to quickly draw away, leaving in their wake a remodeled body of land, taken apart, or drawn back into the sea. The body responsible for these tidal forces, whilst of the earth, does not inhabit it. The moon, our nearest neighbor, pulls vast bodies of water away from the crust of the earth through gravity, water being more physically predisposed to rapid changes than the heavy, seemingly inert matter of soil and rocks, buildings and trees. From space, the seemingly perfect sphere of the earth is distorted, as vast bodies of water are drawn toward the moon away from the earth. We are used to the minimal friction of the body’s movement through air, but cannot fully submerge in water without carrying an extension of the breath. If a liquid is poured into a container in a gravitational field, a surface will form between the liquid and the air above it. This surface has an energy associated with it because the atoms or molecules beneath the surface of the liquid are bound in all directions, while the atoms or molecules at the surface are not bound by equivalent atoms from above. This differential creates an energy known as ‘surface energy,’ which is manifested in a force known as ‘surface tension’—a result of the broken spatial symmetry that enables pond-skaters and other surface-dwelling animals to propel themselves around on the surface of water. As Emmy Noether discovered in the 19th century, all symmetries lead to conservation laws . The law of conservation of momentum, for example (i.e., that the same amount of momentum in moving objects should exist before or after a collision between those objects) exists only in situations for which we have complete isotropic spatial symmetry. When there is a surface, the conservation law exists only in the plane of the surface and breaks down in the direction perpendicular to that surface. The surface creates a rupture in conservation of momentum. The surface also acts as a boundary between states. When we are within the bulk liquid, there is neither up nor down, except for the presence of gravity. This is also true when we are in the bulk gas, but the presence of the surface indicates a direction. The phenomenon of broken symmetry can also give rise to a periodic excitation of the surface, or waves, as we usually call them. These waves travel across the surface of the water, with the surface tension in this case acting as a restoring force. Ripples are excited by the wind, and still-larger waves are created by moving objects, such as boats, within and on top of the water. The disturbance of the liquid by masses that move into the water creates buoyancy, a buoyancy created by the displacement of the weight of water. The boundary between states also exists as a place of transmission and reflection for traveling, longitudinal, wave-like disturbances of pressure commonly known as soundwaves. A soundwave is a traveling fluctuation in pressure or density in a medium such as water or air. A soundwave creates areas of high and low pressure at various frequencies and positions as the wave travels and is reflected, absorbed, and also transmitted by boundaries and objects. Physicists speak of waves ‘interfering’ with each other; that is, combining and subtracting and becoming new waves. Actually, these waves are not individual, but are periodic pressure-disturbances in a medium full of interacting periodic pressure disturbances moving in three dimensions. Two soundwaves together can be thought of as having a phase relationship. Soundwaves that are ‘in phase’ add together in such a way that the high- and low-pressure parts of the wave double in amplitude. This leads to the formation of a new wave of twice the ‘height,’ but with the same frequency. Soundwaves that are ‘out of phase’ cancel each other out: the pressure disturbances in the medium reduce to zero as the high-pressure parts of the wave coincide with the low-pressure parts within the medium. In Fathom, the artists recreated a real-time surface or boundary form within a three-dimensional airspace, a sculptural plane that ruptured the expectation of transmission and dissipation. This form existed as a boundary between a subaquatic sonic world and our own familiar acoustic territory, one that was realized within our acoustic domain inside a large room in an old Royal Navy complex of buildings called Royal William Yard in Plymouth, UK. The Factory Cooperage Building is a huge, dilapidated naval storage space. Visitors to the installation were drawn toward the entrance by the deep sound emanating from the building. Six wooden stepladders in the center of the installation space surrounded by several additional speakers enabled visitors to climb out of the underwater sonic environment, above the Fathom, and hear live acoustic sound relayed by microphones above the water. The confluence of high-end technology and the rundown aesthetic of the building and ladders was intriguing, drawing visitors to the center of the space where the sonic surface of the water could be broken. Only the top half of the space was lit—the space above the sonic surface—and at night this created an atmosphere of water vapor magnified by light. To achieve this, the artists worked with a team including production managers Simon Honywill and Martin Audio to create a sonic ‘surface’ six feet above the ground. The construction of the ‘surface’ was accomplished by using phase cancellation between the sound within the installation and the recorded sound as it was played back by the speakers around the edge of the installation space. The speakers were configured to transmit the soundwaves slightly behind each other at particular times in order to create phase cancellations at certain points within the installation space. This enabled areas of the room to be free of sound within a certain frequency band. Sound from the speakers above 200 Hz (that is, sound from the speakers vibrating the air and in turn creating a pressure wave vibrating at 200 times per second) virtually disappeared above a horizontal line six feet above the floor. The lower the frequency of sound, the longer the wavelength. Low-frequency sounds move large volumes of air back and forth, creating large-scale pressure disturbances that move at the velocity of sound. Below 200 Hz, it was not possible to use the speakers to cancel the phases of the sound, and therefore low frequencies were transmitted throughout the space. In a sense, the frequencies of sound were redistributed by the phase cancellation. The frequencies that were canceled out above six feet from the floor did not simply disappear, but rather reemerged about 12 feet above our newly constructed ‘surface.’ If we were able to reach 18 feet above the floor, we would have been able to hear all of the frequencies of underwater sounds recombining, thus mirroring the sonic environment from the floor up to the Fathom. The slight rise in the frequency of the sound of an object moving towards us, which is caused by the Doppler effect, and the accompanying rise in volume through changes in proximity are also wave-like phenomena that signify arrival. This seems like a very natural thing when we are simultaneously looking at and listening to a moving, sound-producing object, even when listening to the rather otherworldly sounds of a vessel moving underwater. When we listen to a recording of that sound on its own, separated from the image of the vessel, the feeling of arrival is still inescapable. The slowly changing frequencies in the sound recordings are enough to make a listener feel as if they are with a floating, moving mass on the water’s surface. Editing into the temporal place of a fixed media recording of hydro-phonically recorded vessels moving on the surface of water is therefore akin to moving around the arrivals and leavings of the vessels in an abstract time. The editing, repetition, and rupturing techniques used within the recording studio and applied to the underwater sound recordings of the estuarine vessels create a new set of movements, a slow, reconstructed ballet of large masses arriving and leaving, passing and droning, changing slightly all the time. Our brains, listening to the slowly changing sounds, tune into the details. These sounds are hardly changing, and our ears listen in ever more detail for novelty and change. We cannot help but reconstruct the feeling of movement inherent in the slight changes within the soundwaves we hear. In the Fathom installation space, the public were able to move and orient themselves around this reconstructed ballet. They were able to move through and out of the subaquatic sonic environment and were also able to move beyond the installation space to the point at which the real-time acoustic sounds (above the Fathom) were being recorded. The public were also able to make sounds into the microphones; some of the visitors called out to friends whom they knew were listening for them within the installation, perched on ladders, expectant. They would also look for vessels moving both quickly and slowly on Plymouth Sound and run back and to the installation space, attempting to match the moving visual landscape with the ever-changing sonicequivalent. Rather than being a technical, critical, or contextual evaluation, this paper has considered the poetics of Fathom. We have considered the pressures and phases of soundwaves, the surface as a boundary, and the changes in bodies of water and tidal waves caused by the gravitational interaction of the earth and the moon. These were brought together momentarily when visitors climbed up the stepladders and pierced through the sonic surface above the Fathom. Tim Ingold, Being Alive, Essays on Movement, Knowledge, and Description (New York, NY: Routledge, 2011), 112. Luce Irigary, Marine Lover of Friedrich Nietsche, trans. Gillian C. Gill (New York, NY: Columbia University Press, 1991), 13. Dwight E. Neuenschwander, Emmy Noether’s Wonderful Theorem (Baltimore, MD: Johns Hopkins University Press, 2010). Jane Grant is an artist and writer. She was creator of The Fragmented Orchestra with John Matthias and Nick Ryan, winner of the PRSF New Music Award, 2008. Her artwork Ghost was premiered at ISEA Istanbul 2011. Plasticity, a collaborative work with John Matthias, Kin, and Nick Ryan, was at the BFI, onedotzero festival, and Google Campus, London. Jane, alongside John Matthias, was commissioned to create Fathom—a huge sonic artwork that created a sonic surface 6ft above the floor. Jane is currently working on a series of works about black holes and the multiverse. Jane is Associate Professor (Reader) in Digital Arts at Plymouth University. John Matthias is a musician and composer. He has released four albums and his music has been performed internationally including at the Ecstatic Music Festival in New York, The Pompidou Centre in Paris and at the Royal Opera House in London. 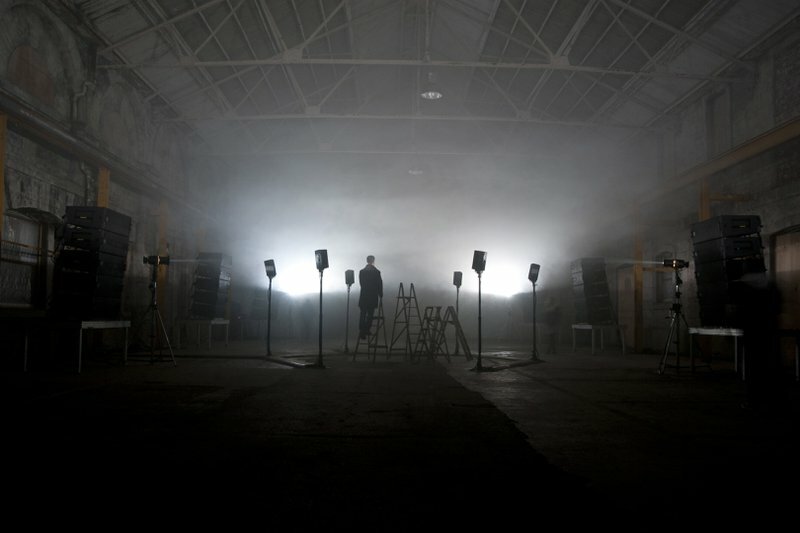 He has also collaborated on many site-specific and performative sound artworks including The Fragmented Orchestra, Plasticity, Fathom, and The Neurogranular Sampler. He has a Ph.D in Theoretical Physics from Exeter University, and is Associate Professor in Sonic Arts and Co-Director of the Art and Sound Research Cluster at Plymouth University.